Soil permeability determines its suitability for disposal of excreta or sewage effluent, and wash water. This is important because some soils cannot safely be used for disposal systems. Systems in unacceptable soils can cause serious health hazards, including contaminated drinking water. An important question concerning soil is how fast it will allow waste liquid to percolate or flow into it. In other words, what is the soil permeability? If the waste liquid percolates too fast, the soil will not have a chance to treat it by removing disease-causing pathogens, and the waste liquid may seep into and contaminate the groundwater. If the waste liquid does not percolate fast enough, it may overflow to the ground surface, causing serious health hazards. Different types of soils have different soil permeability and percolate waste liquid at different rates. Some types of soil are acceptable for disposal systems, but others are not. Soil types can be identified by sight and feel. When testing soil by feel, test it when both dry and moist. Individual grains are easily seen and felt. A handful of sand squeezed when dry will not hold its shape; squeezed when moist it will barely hold its shape, crumbling when touched. Sand has high soil permeability. Contains a large percentage of sand so that sand grains can be seen and felt. Squeezed when dry, a handful of sandy loam will not hold its shape; squeezed when moist, it holds its shape and forms a cast that will not break when handled carefully. Sandy Loam has acceptable soil permeability. Has a fairly smooth, yet slightly gritty feel; clods crumble easily. Squeezed when dry, loam forms a cast that can be handled carefully without breaking; squeezed when moist the cast can be handled freely without breaking. Loam also has acceptable soil permeability. Feels soft and floury; clods are easily crumbled. Squeezed when dry or wet, silt loam forms a cast that can be handled freely without breaking. A small ball of moist soil pressed between thumb and finger will not form a ribbon. Silty Loam has acceptable soil permeability. Fine-textured; clods are hard. Moist clay loam is plastic and, when squeezed, forms a cast that can withstand considerable handling without breaking. A small ball of moist clay loam pressed between thumb and finger forms a thin ribbon that barely sustains its own weight. Clay Loam has low soil permeability. Fine-textured; clods are very hard. Wet clay is plastic and usually sticky. A small ball of moist clay pressed between thumb and finger forms a long ribbon. Clay has very low permeability. 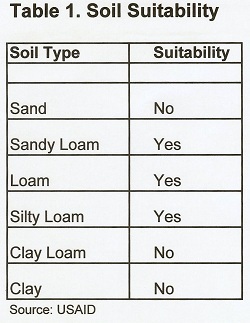 When the soil at the proposed site has been identified by sight and feel, use Table 1 to determine whether it is suitable for a disposal system. Most disposal systems require a minimum of 1 meter of permeable soil below the bottom of the system and above the highest groundwater level, bedrocks or impervious layers. The most direct method of locating groundwater levels, bedrock, and impermeable layers is to dig a test hole. The hole must be 1 meter deeper than the bottom of the proposed system. An auger with extension handles is an ideal tool for digging test holes. If an auger is not available and the hole must be dug with a shovel, be very careful if the hole Is deeper than 1.5m. The sides must be shored up to prevent cave-in and possible serious injury. Bedrock or impermeable layers are easily identified in a test hole as it becomes extremely difficult to dig and the soil consists mostly of rocks, shale, or tightly packed, consolidated material. If bedrock or impermeable layers are reached before the test hole reaches the proper depths, the proposed system cannot be constructed as designed. (3) select and design an alternate system that can be used at this location. The same hole used to test for bedrock can be used to find groundwater levels. Groundwater is easily identified in a test hole. After a few hours, the hole will fill with water to the groundwater level or moist soil will be found at the around- water level. Since the highest yearly groundwater level must be found and since groundwater levels fluctuate throughout the year, test for ground- water during the wettest season. If the highest groundwater level is encountered before the test hole reaches the proper depths the proposed system cannot be constructed as designed. There remain the three choices noted earlier. If the soil type, bedrock layer, and groundwater level are all acceptable and the proposed system is a pit or improved latrine the system can be constructed on the site with no further testing. Return to "Introduction to Sanitation Facilities, Part 1" from "Soil Permeability"